Armstrong Memorial tournament champion Christian High. LAKESIDE – West Hills sophomore KYLE DOBYNS poured home 25 points, including 4-of-4 from the foul line in the fourth quarter, as the West Hills Wolf Pack rallied to defeat the host El Capitan Vaqueros, 56-50, in a non-league game on Wednesday. Dobyns scored 10 points in the final period. Junior JAQORI HARRIS and senior RANDY TUCKER combined for 10 points in the first quarter for El Capitan, which led 16-10 after eight minutes. After a quick El Cap hoop made it an eight-point lead, West Hills charged back with an 8-0 run capped by a three-pointer by sophomore CASH CREIGHTON. But Vaqueros junior guard JACOB PFITZNER answered back with a three to regain the lead for his team. West Hills sophomore ASHTON AVESTRO made a three late in the first half as El Capitan led 26-25 at intermission. El Capitan eventually took a 42-36 lead in the third quarter. However, Dobyns scored six consecutive points early in the fourth for a 45-44 Wolf Pack advantage. The Wolf Pack was still down a couple of possessions moments later after Pfitzner nailed a field goal. With under two minutes to play, Avestro made a pair of free throws, then followed it up with a basket to give the Pack a 51-50 advantage. “Our sophomores stepped up in a big way,” West Hills coach ELIAS TOTAH said. “Kyle Dobyns was magnificent in all phases. We really like the contributions he is giving us on both ends of the floor. Avestro added another free throw and junior JAYDEN MORENO made a basket for a four-point lead in the final minute. West Hills improved to 4-3, while El Capitan fell to 3-4. 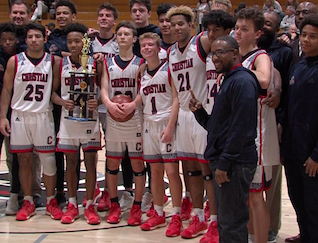 CHRISTIAN 69, SANTANA 38 – The Christian Patriots outscored the Santana Sultans, 28-1, in the third quarter to pull away in the Horsman Automotive Tournament game at West Hills High. Christian High got the game off to a flying start when senior JACKSON LARSEN tipped the ball ahead to MILES WILLIAMS, who quickly flipped a pass ahead to the striding Larsen, who dunked it for a quick deuce. The teams were nearly even after just one period, as the Patriots led 13-12. However, Christian High outscored the Sultans, 15-8, in the second quarter. Larsen had a dunk with under six-and-a-half minutes to play in the third quarter to give Christian a 36-30 lead. The Patriots, who were declared the tournament champion with a 5-0 record, improved to 6-2. Larsen was the tournament MVP. DESMOND WILLIAMS hit a three-pointer for Santana in the first quarter. He finished with 18 points. The remainder of the tournament games will be contested. No championship game will be played. RANCHO BUENA VISTA 57, HELIX 45 – The Helix Highlanders ran into an older, more physical opponent in the Rancho Buena Vista Longhorns on Wednesday, dropping a contest at the Hilltop Invitational. The Highlanders trailed 29-23 late in the first half, but the Longhorns hit a three-pointer with 30 seconds to play before intermission. RBV added another hoop moments later to lead by 11 at halftime. Helix trailed 34-25 with 6:30 to play in the third quarter when the ‘Horns nailed a three to go up by 14. The Longhorns led 49-37 with seven minutes left in the game when they extended their lead to 14 points once again on a wide-open play as Helix’s defense fell behind. MAURICE HOLMES, a junior, scored 18 points, including three three-pointers for the Highlanders. KEISHON TRICE had eight points for Helix, while KAI JESSIE added six points for Helix. SAMMY STEWART had five points for the Highlanders. MT. CARMEL 60, GRANITE HILLS 25 – The Sundevils won at the Armstrong Memorial Horsman Automotive event at West Hills High.